Monday was about as close as we have come recently to a capitulation event. Decliners beat advancers by a 6:1 margin and volume was nearly 8 billion shares. The Dow was down -759 intraday and the Nasdaq fell -258 before closing down -193 or -2.7%. The biotech index fell -4.9% and the chip sector dropped -4%. This was a classic washout. The new tariffs by China on 128 U.S. products got the ball rolling late Sunday and then another tweetstorm attacking Amazon helped to crash the tech sector. Amazon declined -75 points. 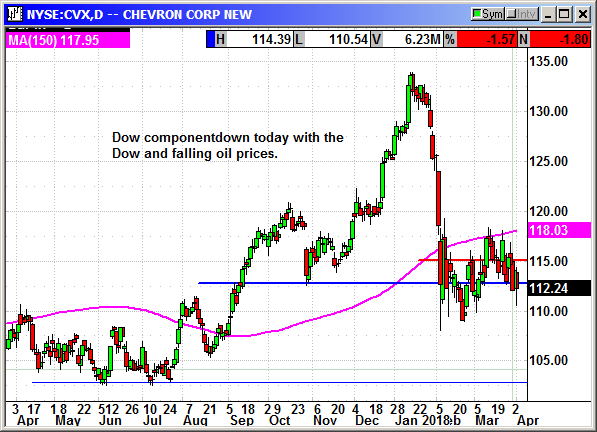 Multiple analysts were out over the weekend preaching doom and gloom while others were suggesting a big rally was approaching. Uncertainty is rampant and investors do not like uncertainty. They want a stable, directional market and that disappeared at the end of January. 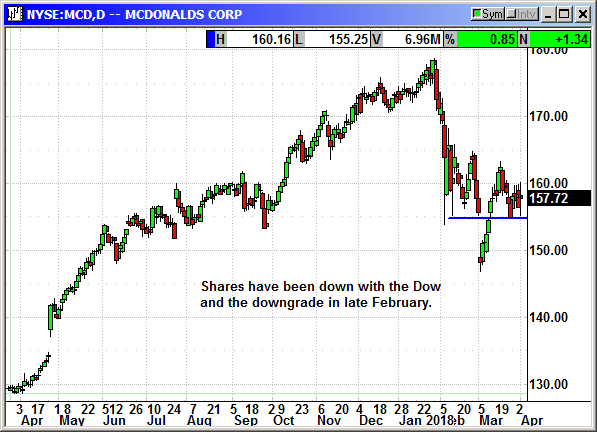 The initial rebound from the first correction was bought aggressively but once the markets began to near the old highs, the selling began again. After two weeks of choppy declines, the new tariff headlines pushed the indexes off the cliff. 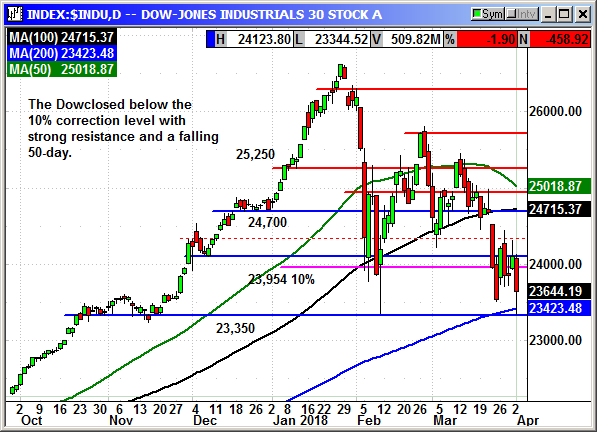 The Dow retested the February low of 23,360 with an intraday low of 23,344 on Monday. That is about as close as you can get with a 23,000-point index. The Dow narrowly avoided closing with a lower low but I am not sure it matters given the bearish outlook on the chart. 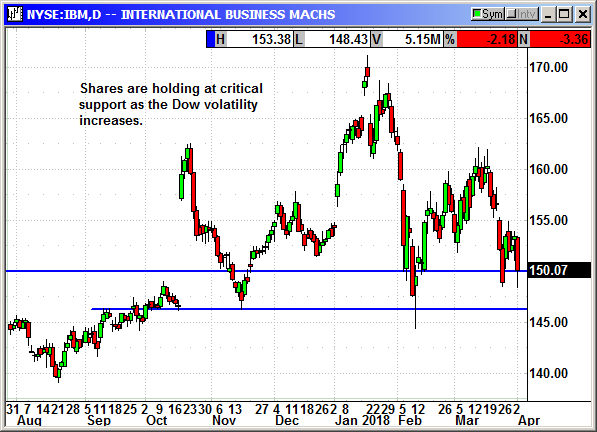 There is solid resistance around 24,100 and devent support at 23,423 and 23,350. We simply need several consecutive days without any negative headlines. 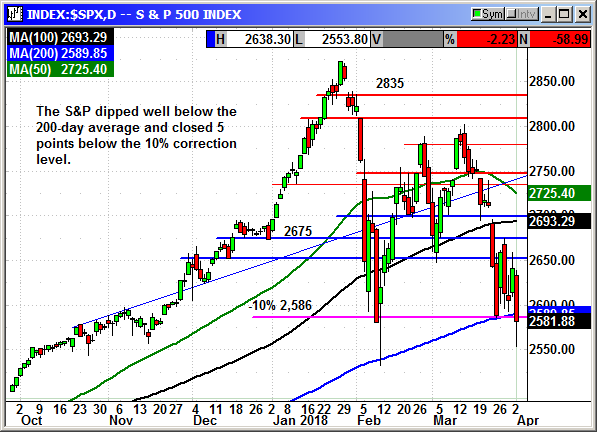 The S&P crashed well below the 10% correction level at 2,586 and hit 2,553 at the intraday low. The afternoon rebound lifted it back to within 5 points of that level again and exactly where you would expect a retest to stop. The S&P futures have been up as much as 13 tonight so anything is possible on Tuesday. Unfortunately, the chart is still bearish. The Nasdaq was the destructive force in the market on Monday led by a 75 point drop in Amazon in response to a new tweetstorm. Amazon is down 15% since the attacks started two weeks ago and that is a major anchor for the Nasdaq. 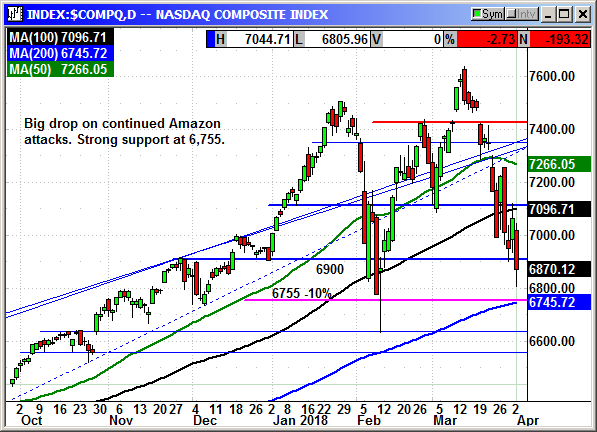 The Nasdaq is nearing the original 10% correction level at 6,755 and the 200-day average at 6,745. This should be strong support. 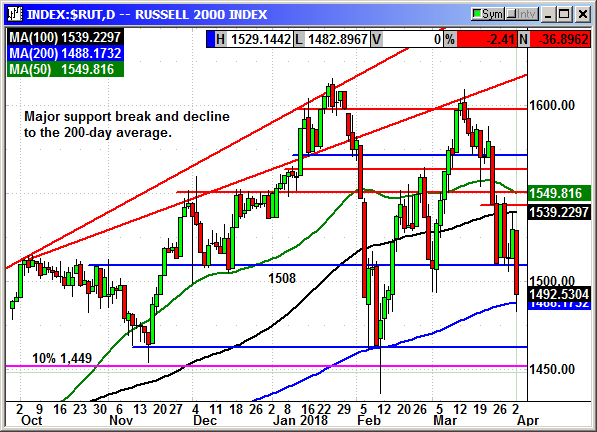 The Russell 2000 also collapsed but remains well above the 10% correction territory at 1,449. 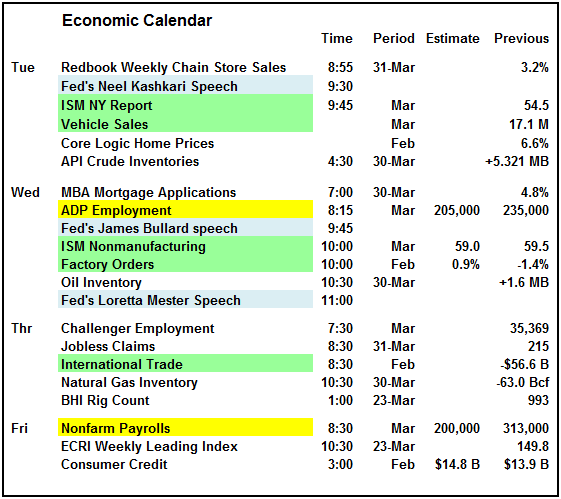 This is payroll week with the ADP employment on Wednesday and Nonfarm payrolls on Friday. Unless there is a major downside miss of expectations, they are not likely to move the market. Investors are much more worried about tariffs than jobs. 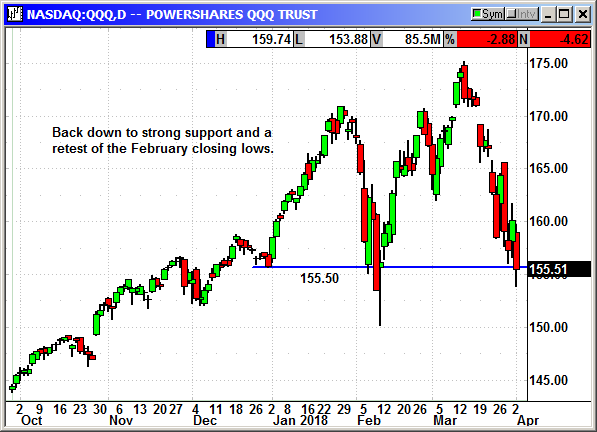 The market appears poised to rebound on Tuesday but I would remain cautious. 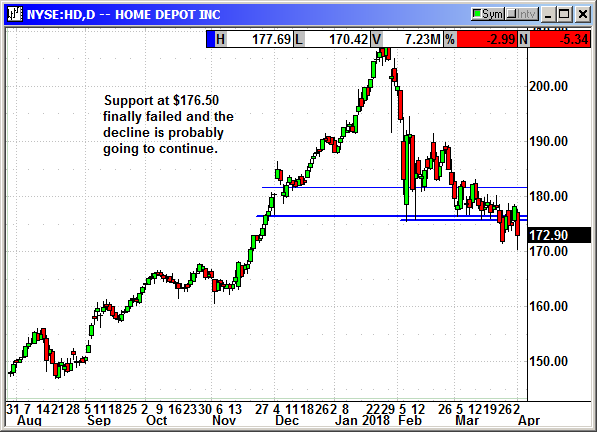 Every recent rebound was sold hard the following day. Be patient and wait for a positive trend to develop. 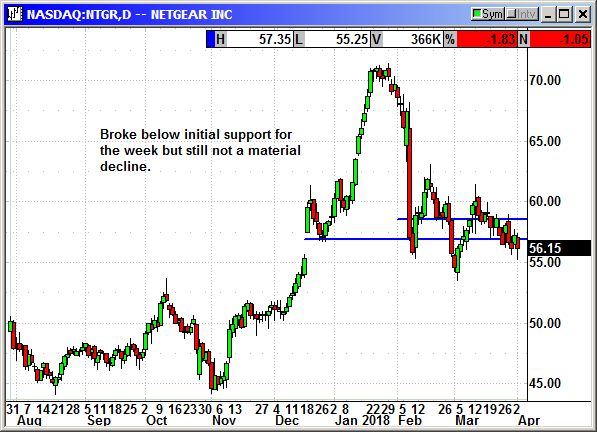 The charts are technically bearish until we get several consecutive days of decent rebounds. Buy May $165 call, currently $2.37, stop loss $153.85. The short side was stopped on Wednesday. The long call positions were stopped at the open on Tuesday. The long call position was stopped on Monday. No specific news. Shares traded sideways last week but declined sharply today. After the headline related stock drop, the odds of ABBV shares returning to $115 before the May expiration are very slim. I am recommending we drop this position. I would not close it for 25 cents because miracles do happen. Just keep it in your portfolio until expiration. 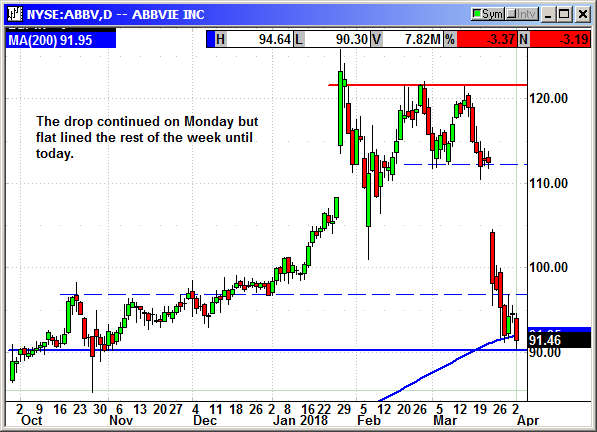 Update 3/26//18: AbbVie has had a tough week. They announced a disappointing drug trial and was told to pay $3 million to a man who had taken Andro-Gel and had a heart attack. Shares fell $19 on the multiple headlines. The court threw out a $150 million jury verdict on Andro-Gel but awarded the $3 million because the company had "acted negligently." Multiple companies are being sued over similar products. Eli Lilly, Endo Pharma and GlaxoSmithKline have tentatively agreed to settle hundreds of suits. AbbVie has more than 4,000 cases still pending. The negligence verdict could be a problem because it gives the other 4,000 cases a precedent to use in their cases. Dropping 4/2: Long May $115 call @ $3.70, exit .26, -3.44 loss. 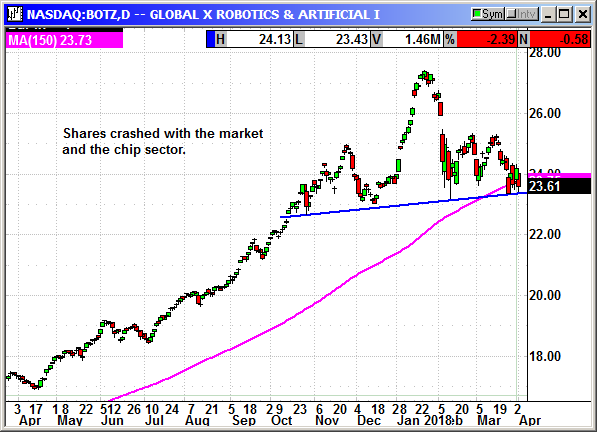 BOTZ fell back to support as the chip sector declined -4% today alone. Support is holding. No specific news but the threat of tariffs from China knocked off another $3.50 today to clos eright on support. No specific news. 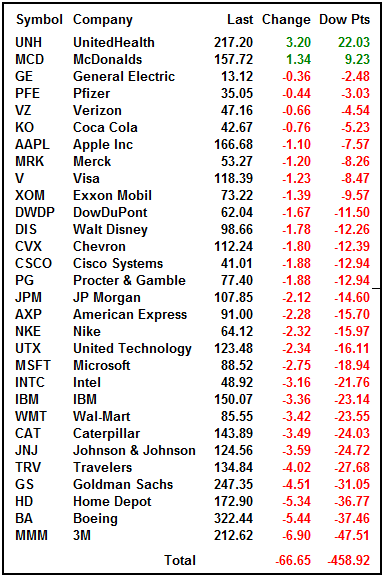 Shares down with the Dow and falling oil prices. Ground hog day, chapter 7. 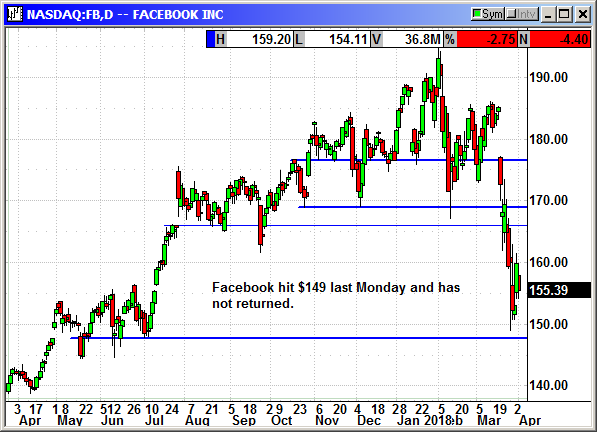 The bad news just keeps repeating for Facebook and fortunately, we were stopped out at the open last Tuesday. Unfortunately, it was for a loss regardless of whish position you opted to play. I believe Facebook will recover. Recent surveys show that users are not leaving the website. In fact they are actually reading more news to try and understand what happened. I considered adding it back in as a new position but the call options are out of sight on price. Update 3/26: Will this nightmare ever end? We definitely jumped the gun on buying the Facebook dip. Shares were $185 before the scandal broke and they plunged a low as $149 intraday today after the FTC confirmed they were opening an investigation. Under a 2011 consent decree a $40,000 fine was established for every privacy violation. With 51.3 million accounts stolen in the 2014 event, that could be over $1 trillion. You can bet the government watchdogs are going to be hyperventilating over the prospect of the biggest fine in history. Obviously, it will not be $1 trillion but it could be a lot. Possibly in the tens of billions if they are found guilty. It will be years before any case ever comes to trial but the damage is being done to the stock today. 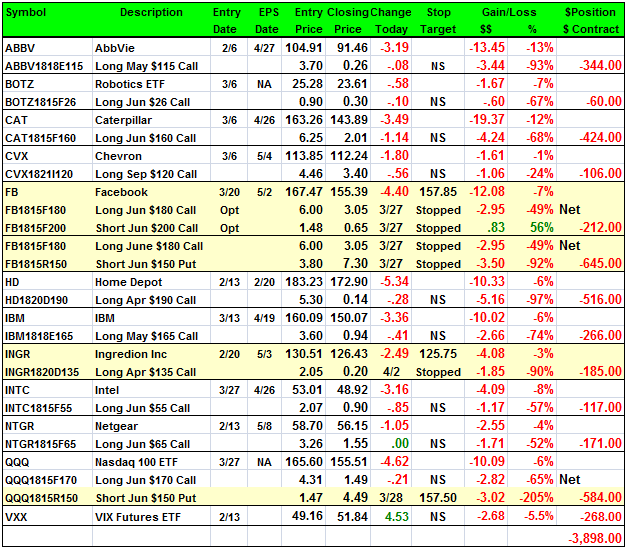 Closed 3/27: Long June $180 call @ $6.00, exit 3.05, -2.95 loss. No specific news. After the recent support break there is no hope for this position. I am recommending we drop it from weekly coverage. Dropping 4/2: Long April $190 call @ $5.30, expiring, -5.30 loss. IBM actually had a decent week but gave back the gains on Monday. No specific news. 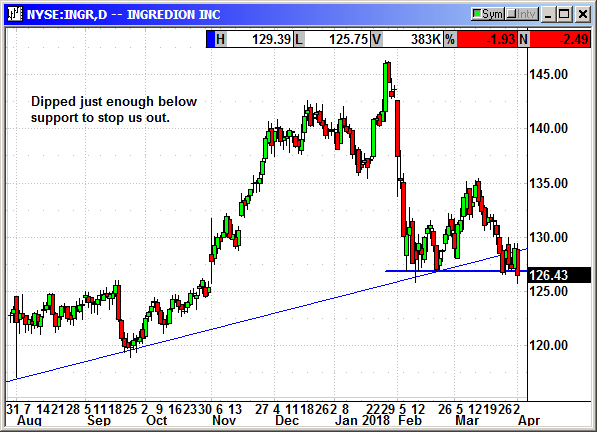 Ingredion dropped just enough in the Nasdaq crash to stop us out exactly at the low of the day at $125.75 on an intraday support break. No specific news. 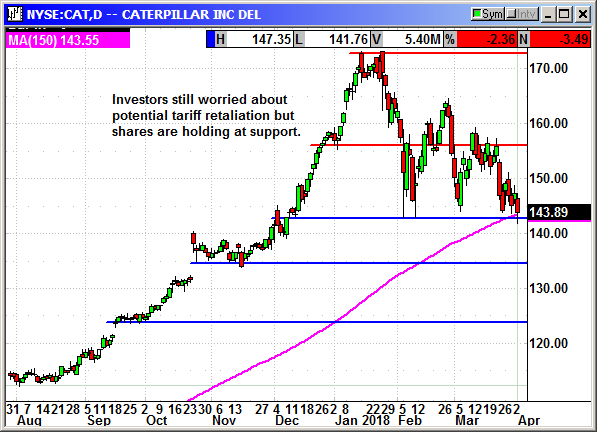 Shares faded with the market but remain close to support. The Nasdaq imploded on Monday with a -250 point drop intraday and -193 at the close. The short put position had already been stopped out on Wednesday. 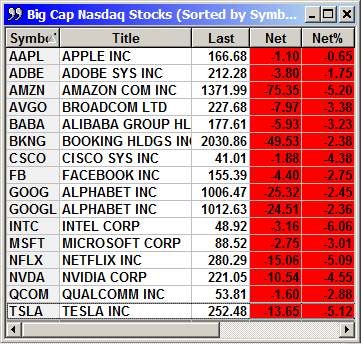 I seriously doubt the Nasdaq is going much lower and I am recommending we reload that position using the June $140 put. That will help erase some of the loss we took on that stop. Sell short June $140 put, currently $2.59, stop loss $148. Closed 3/28: Short June $150 put @ $1.47, exit $4.49, -3.02 loss. Volatility spiked again with the Dow's nearly 800-point intraday decline. After a successful retest of the February lows, we should be nearing the end of this temper tantrum. It normally takes 4-5 weeks for volatility to return to normal after a high volatility event and we are now a couple weeks past normal. The VXX always moves lower eventually.